It was a really interesting day at Smart London Camp 2018 today. The meeting was an unconference so no sessions were advertised in advance but lots of choice was on offer after the initial pitching session. The event organisation (mainly by people in the GLA I think) was also very good. I went to 5 sessions covering: the ethical considerations around the widespread collection of data (much of it personal) on our city streets; the use of technology to encourage volunteering; the structuring of data to support re-use; the ways in which we can create a data culture and grow our collective data literacy; and the use of chatbots and voice interfaces in public sector service delivery. Of these, the better sessions were those that had a specific question or challenge to work on. 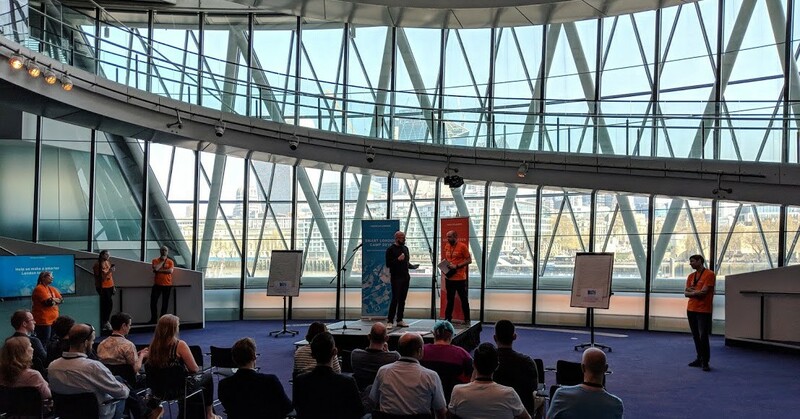 For example, “what can London to to encourage a ‘data culture’?” These sessions forced people to propose solutions, rather than just having a general discussion on a particular area. My personal take-aways were around the need for greater data literacy (which came up in all the sessions I went to in one form or another) and greater digital literacy (which seems to be easily confused with data literacy — not surprisingly — but which has a different, though related, context). In both cases, the underlying question seems to be around how Smart London can develop and encourage a society in which levels of data and digital literacy are increased. There was also a recurring theme around the need to focus first and foremost on user-need, rather than on technical solutions looking for a problem. It seems obvious to say it, but if we really want to give people greater control over the way services are delivered, if we want to empower them in the political process, if we want them to grow economic activity in the digital environment, if we want them to take greater ownership of their own health and the environment, then we need to increase their ability to make sense of data and to interact online safely and with confidence. 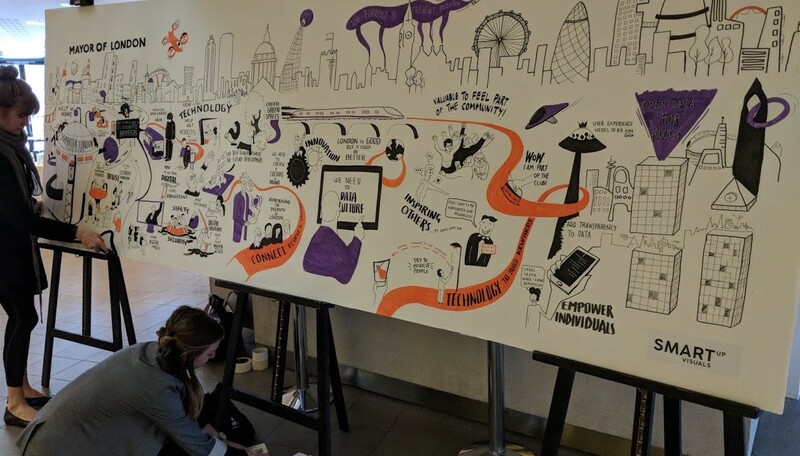 This is partly a challenge for the providers of ‘public’ services to the city (typically those in the public and third sectors) who generally need to look at their own culture and skill sets and ask themselves how they are going to digitally transform. But clearly, there is also a question for the wider community; for schools, for the health service, for businesses, and so on. And for individuals. Thinking purely about transformation of local government for a moment… it strikes me as critical that any transformation to support the development of smart cities is not done by individual councils in isolation. The last thing that I want as a tax payer is for every local authority in London, much less in the UK, to invest effort on their own in defining data ontologies or in thinking about good practice when building chatbots or voice interfaces or whatever. We need to see much greater levels of collaboration, and much greater sharing of knowledge, around the ‘new digital’: around data, IoT, ML, AI, voice and so on… in much the same way that GDS has enabled the sharing of good practice around the delivery of services on the web. Secondly, as a resident of Bath & North East Somerset, I want to understand how Smart London can impact on Smart Bristol or Smart Bath. Ultimately on Smart UK. Some of the discussion today was about how the London boroughs can work more closely together. But the kind of geographical partitioning represented by our political borders are of little interest to the citizen in practice. If I live outside London but work in London then a smarter city without a corresponding smarter rural area fails to realise the full potential of the opportunity presented by digital. There is no doubt that much of the locus of smart city thinking in the UK will happen in London. Rightly or wrongly that is more or less inevitable. Size will dictate. So let’s find ways of making sure that London learns from other cities (both within the UK and around the world) and that other cities in the UK can learn from London’s experience. That way, we can all benefit.